Q: In what order do the sections come on the actual test? In this video, we are going to talk about the GRE format, what to expect in terms of the sections that are on the test and the length of those sections. So first up, there's something called the AWA section. That stands for analytical writing assessment. You don't really have to know that. What you should know is when you see AWA, think, "Ah, the essay section." Next you're gonna have a quantitative section. And that consists of two sections. Just as the AWA consists of two essays, the quantitative section consists of two sections. Next we have the verbal, which also consists of two sections. There's a lot of two, two, and two going on here. Note that consistency. but then we have this crazy section called the experimental section. The experimental section is just going to be one section. just one section. Now what is the experimental section? I think that's the question that a lot of people have. it's a strange section because it's not actually graded. Secondly, there is no way for you to determine whether a section you're getting is an experimental section. 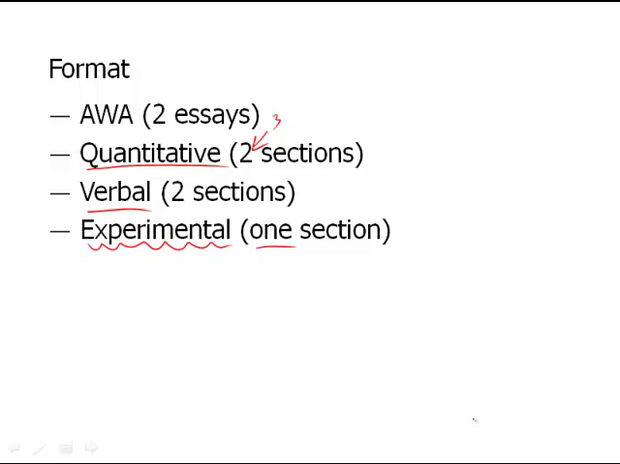 Next, you don't know if that experimental section is gonna be quantitative or verbal So if you get a test and that test has three quantitative sections, that is, at the end of the test you finish up and there are three, not two, then you can at least infer that one of those sections was the experimental section. Again, there's really no way of telling so always do your best and always expect this experimental section. Now, you're probably wondering, how How much time does all of this take? Well, let's start with the essays. We have here the issue essay which takes thirty minutes. Now you may be tempted to ask, "Oh, tell me more. What do you mean by the issue essay?" For now or at least in this video, we're dealing more with high level, big picture, what are the names of the sections and how long do they give you? But if you're really tempted, you can navigate on the lessons page down to where it the essay section, the AWA section, and you can click on the video entitled "issue" and you can learn more about the issue and you can also learn more about the argument. But for now In this video we wanna remember that there are two essays, issue and argument, and you get 30 minutes for both essays. So basically you'll be writing for one hour. Next, there is, as we mentioned, quantitative or math section. So those are used interchangeably. Quantitative means math, math means quantitative. And in this case, we have twenty questions and you have 35 minutes for the entire section. You'll note that that works out to not quite two minutes but actually a minute and 45 seconds per question. So that's something to keep in mind when we go into the pacing which comes later. As for the verbal section, same number of questions but actually five fewer minutes, which works out to a minute and a half per question. Again, good thing to keep in mind when it comes to pacing. What does this all mean, though? Well, in terms of total hours, four hours. Now you wonder, well, how does that actually work? Four plus is an awfully long time. If I'm spending an hour here on top on the essays, then that's three plus hours sections. But remember, you're gonna have multiple math sections and multiple verbal sections. And you throw in the experimental section, next thing you know you are clocking in at over four hours. And of course, there's always checking in, sitting down, answering a few questions, determining whether or not you wanna keep your score at the end. All of that feeds into four plus our mark. Now while I'm at this screen, I think something that is important is the flow of the sections. Some people might think, "Well, if you get a math section, it's followed by another math section, followed by a verbal section, and it's something very orderly. But remember, there's an experimental section in here, so they really wanna randomize things as much as possible. What that means is that the math section may be the very first section you see, or maybe you'll see a verbal section. Maybe you'll get back-to-back verbal sections or maybe there will be a math section in between. Or maybe the very first section you see is an experimental verbal section. Or maybe be an experimental math section. So, again, a lot of randomness. Try not to get thrown off test day. Just expect anything once you're done with these two essays, which, by the way, are always in this order. You start off with the issue, followed by the argument. But after that, it's gonna be math, verbal, and it could be an experimental section. You don't know. Just keep yourself prepared. and again, when you finish that first section, the next section you get, well, it could be a math section, or that is, it could be the same section as you got on the first section. You don't really know. So again, be agile as possible.